If you're a coach of some sort whether your world is health, business, life and everything and anything in between - you are in a position to change people's lives. You can use your words to motivate and inspire people to be the best version of themselves. Let's not forget another essential piece to the puzzle - you need to make sales right? You need to be effective in your marketing efforts if you're going to inspire people to take your course, join your coaching program, or whatever the case may be. Here's something you need to understand: Our decisions can be influenced. This course teaches you how to reach your reader in a way that is authentic and genuine so they connect with you in way that creates the interest and desire to take it another step - to purchase from you. 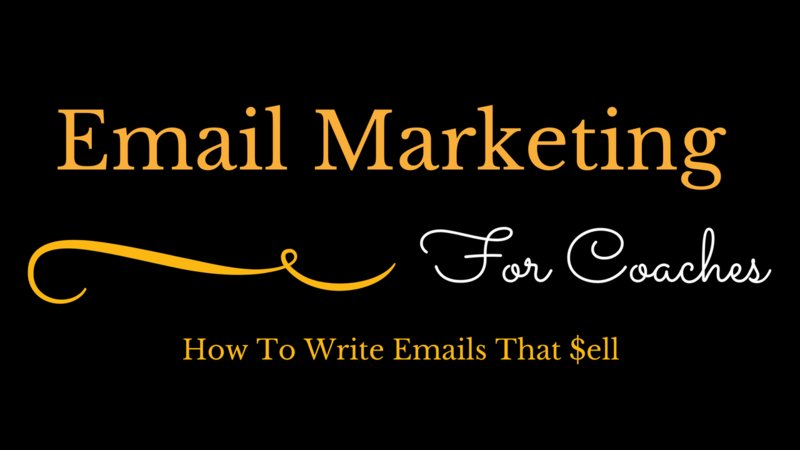 This is a course to teach you how to write great emails that will attract clients and buyers. However, you're going to find many undertones and a few surprises in the mix. I am a professional behavioral marketing person but before I was anything I was a sales executive, an award-winning one. As a result you're going to get a little more than you bargained for - and you are going to LOVE it. :-) Everything I create has an undertone of not only attracting your ideal client but creating the sales you need to not only sustain your practice but make you wildly successful. So if you've ever taken a course on email marketing - this one is going to be a very unique journey you're going to get some unexpected knowledge bombs from. Let's talk about the 3-Part Course! I remember a time when I was very naive and thought everything I said and did had to be perfect. Have you ever felt that way? Turns out the contrary is correct. People will buy from people they personally relate to and guess what? People for the most part aren't perfect. If you want to write newsletters that inspire people you have to let them see who you are. Who you really are. I share with you in this lesson my most prized method of writing - you're going to be shocked, but hey it works for me and it very well could work for you too! If you were single and going out with your friends to look for someone you could potentially date what would you do? Hopefully you would get dressed up and look like the best version of yourself so you could attract a potential date right? You have do the exact same thing for your target market. Here in this lesson we will talk about not only the identification process of your ideal perfect client but also how you will attract them. There is so much power in knowing WHY. Why do you do the things you do? Why do other people do the things they do? It's more complex than you think, in fact it's science. A science I want to teach you. I will share some things with you in this lesson that won't only change the way you write your emails but may have you going back to take a second look at everything tangible you've created to attract your client. After all, this isn't about you. You know that right? It's about them - meaning whomever it is you serve. "Language is the foundation of civilization, it's the glue that holds everything together, and it's the first weapon drawn in a conflict." The way you use your words is how you reach people, it's how you convince them you are worthy of their time and financial investment. We now live in a 3-second attention span world but even so our decisions CAN be influenced. In this lesson we will talk about how you can use certain words in your email marketing efforts, your Facebook ads, or any other marketing effort to trigger the desired action in your target market. "Features tell but benefits sell." In lesson 5 I will unfold for you how to create marketing messages that stay on the emotional side of the brain where we make most of our decisions. Talking in technical terms about your product or service triggers the logic side of my brain. Guess what happens then? Well, nothing. People will over-analyze the decision to buy, then delay it, and usually never come back. You know what I love about storytelling? It's as old as time but yet it's still relevant and STILL the most amazing way to market your business. Here we will talk about the impact of storytelling and how it can cause a person you've never met to connect with you in a deep way. A way that will make them want to be your client. Love languages aren't just about romance! In fact, this science, when applied to our business can create amazing things to happen. When you learn to apply the love language theory to the relationships you have with your clients your business will grow like never before! Throughout this course you will hear me talk quite a bit about neuromarketing and its impact on our life and business. Neuromarketing and the principals of persuasion move hand-in-hand. We will talk about each principal of persausion and how to use them in your practice. So many times I hear, "I don't know what to write about" or "What if I run out of ideas". Before you can dazzle someone with your words you have to first have them at hello. You have to get them to take that first step to knowing you better. I have written over 2,000 email pieces over the past several years. Here in this lesson I reveal to you my top performing subject lines. Here's the cool thing - my top subject lines aren't about marketing (Go figure huh?). In fact they are very neutral and have been tested with completely different business models and were still successful. I will reveal to you my top 5 and we will discuss why I feel they were so successful. You're going to love this! This lesson will be about the boundaries and good etiquette of email marketing. I've done this for many years very successfully and these are my commandments, keep them and you will do well. You can't dazzle anyone with your emails if they never make it to their inbox! Email marketing is very difficult these days. There are many layers of privacy and protection you have to get through to reach your subscriber. This lesson is going to be about spam prevention. You can’t totally eliminate your emails going to spam folders, it IS going to happen to some degree. But if follow these rules hopefully you can keep it to a minimum and a large portion of your emails will make it to your readers inbox. Here in this lesson we’re going to dissect a well-written email. I want to show you step-by-step how a well written email that makes sales is laid out. I didn't want this email about my field which is marketing instead I chose to step outside of my shell and I wrote it as if I were a nutritional coach. The way it is laid out, whatever your place is in the world, you will be able to relate it to your practice. This email is from my personal trophy cabinet and even though I wrote it in 2013 it is still one my most successful and favorite. The reason is because it changed everything for me. This was the email that revealed to me what my purpose was to be. I have been living it ever since. The really funny thing was I didn't even really know what I was doing back then. This was before I understood matters of the brain, all I relied on was my heart. Which to a degree I still do today. This email scored my first coaching client and two consulting clients which brought me $37K that year and started me on my journey. I have power-packed the bonus chamber with goodies! Bonus 1: A step-by-step design guide to setting up your MailChimp newsletter. It's over 200 pages and takes you through every facet. Bonus 2: A segment on power words. Power words and trigger words are pretty much all in the same with a little difference. Here you will find a video on how to use them as well as a list of the top 100 power words. Bonus 3: The 7 Tips to Email Marketing Success: This is an eBook I wrote last year, it's very good and has a few different perspectives I don't cover in my course so I decided to include it here. Bonus 4: A list of my top 100 subject lines. Bonus 5: A list of the top spam words NOT to use in your subject lines. Bonus 6: A guide to know what a good open rate is so you can measure yours against industry standard. Email Marketing that $ells for Coaches is a power-packed course that will teach you how to create emails on a whole other level. The course is 14 lessons long and comes with a Bonus Chamber. Purchase it today and learn how to write emails that SELL!